One sunny day, Errol finds that Thomas is sad, even when they are playing in their favorite ways. Errol can't figure out why, until Thomas finally tells Errol what the teddy has been afraid to say: "In my heart, I've always known that I'm a girl teddy, not a boy teddy. I wish my name was Tilly, not Thomas." And Errol says, "I don't care if you're a girl teddy or a boy teddy! What matters is that you are my friend." Jessica Walton lives with her wife, son, and cats in Melbourne, Australia. 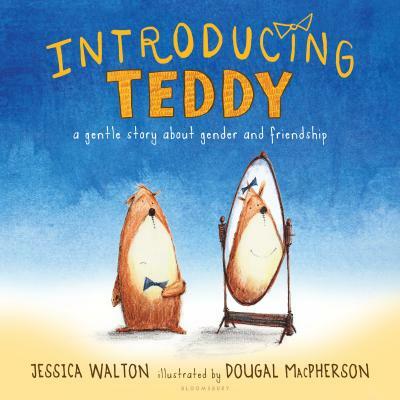 She was inspired to write Introducing Teddy after her father transitioned into the woman she had always been on the inside, and Jess wanted to find a way to tell that story to her young son. A former secondary teacher, Jess is passionate about literature, board games, the ukulele, and funky prosthetic legs (her current one features green dragon scales). This is her first book. Dougal MacPherson once drew a truck on a rainy Sunday afternoon to entertain his young son. Since then, he has illustrated for tech websites and conferences and now, a children's book. Dougal lives with his wife, son, daughter and a cat called Monster, in Australia. He documents the antics of his family through fifteen-minute drawings in a popular Instagram account.